By early July, in most years, atmospheric adjustments produce a mean westerly airflow over Labrador, and a southwesterly one over the island. This marks the onset of summer conditions. The character of the summer then depends upon the position and relative strengths of two weather systems: a low pressure area centred near Ungava Bay (northwest of Labrador), and the western portion of the North Atlantic sub-tropical anticyclone, centred near Bermuda. Since Labrador is under the influence of the former system it has changeable summer conditions. The influence of the warm Bermuda anticyclone is increasingly likely in the southeast of the island. 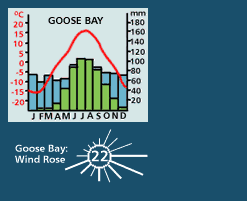 On the island, the spatial pattern of summer temperatures is strongly influenced by the prevailing (SW) wind direction, and distance from open salt water. Image modified by Duleepa Wijayawardhana with permission, 1998. Reproduced by permission of Gary E. McManus and Clifford H. Wood. From Atlas of Newfoundland and Labrador (St. John's, NL: Breakwater, ©1991 MUNCL) Plate 6.5(b). Southern coastal areas are relatively cool overall, because the prevailing onshore winds are chilled by sea surface temperatures of 10-13°C. Sea fog is a regular occurrence. However, these onshore winds also moderate the nighttime temperatures near the southern and southwestern coasts, which extends their frost-free season to almost five months. Courtesy of Gary E. McManus and Clifford H. Wood, Atlas of Newfoundland and Labrador (St. John's, NL: Breakwater, ©1991 MUNCL) Plate 6.4. Image modified by Duleepa Wijayawardhana with permission, 1998. Average temperature decreases towards the north. 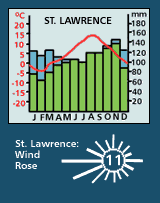 The frequency of very warm days (maxima above 25°C) is greatest over central and western lowland districts of the island, such as the lower Exploits and Humber valleys, including the Corner Brook area. These locations will typically experience a few daily maxima near 30°C each summer. Being removed from the threat of coastal sea fogs and low cloud, these are also the areas of most frequent summer sunshine, although the inner reaches of the east coast bays also experience a relatively high number of bright sunshine hours. 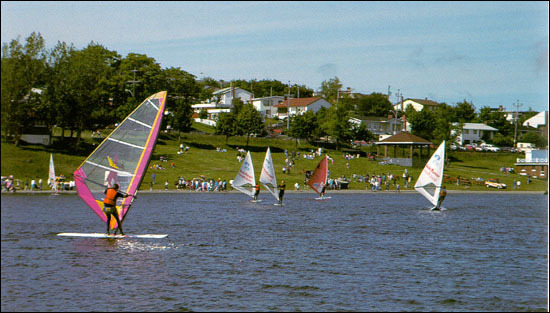 Located in the heart of St. John's, Quidi Vidi Lake is a popular attraction for the city's residents. Reproduced by permission of Ben Hansen. From Ben Hansen, St. John's, NL (Dartmouth, N.S. : James Stonehouse Publications, 1991 ©1996), 72. 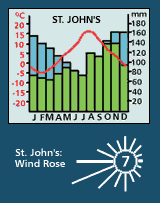 The relative dryness of the April to June period is continued into July over eastern sections of the island, especially on the Avalon peninsula, due to the influence of the Bermudan sub-tropical anticyclone to the south (see climagraphs: St. John's, St. Lawrence, with legend. However, a trend to increasing rainfall for July and August characterizes areas further west and north, where more frequent low pressure systems, combined with stronger daytime heating over inland sections, produces more frequent rain. 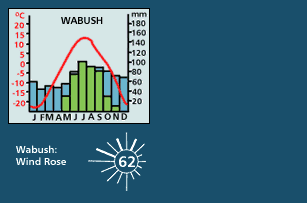 Indeed, over central and western Labrador, July and August are normally the wettest months of the year (see climagraphs: Goose Bay, Wabush with legend. Toward the end of August, and into September, the possibility exists for a tropical storm to approach southern Newfoundland. 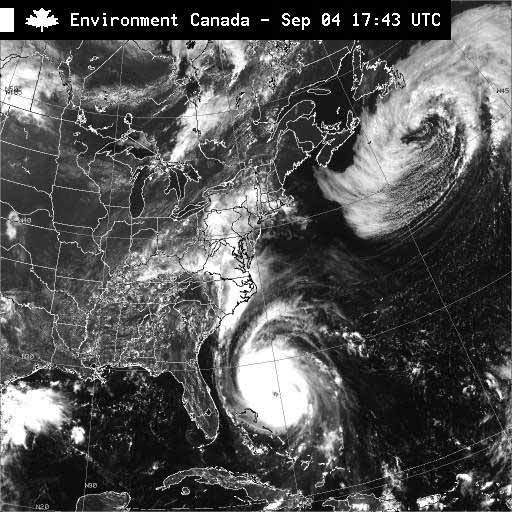 The visible wavelength GOES satellite image for the afternoon of 4 September, 1996 shows two tropical storm systems at differing stages in their life cycle. If these warm air cyclone systems track close enough to the island, intense rain can fall over a short period. 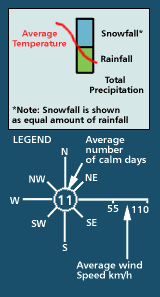 Such was the case on September 11, 1995, when tropical storm Luis was responsible for approximately 100 mm of rain over parts of the Burin peninsula, causing land slips and damaging roads.